JStore allows developers to protect their strategies source codes by providing an access to trader for remote strategy launching only on a Dukascopy Remote Servers. You have written a strategy for a trader. You have saved the strategy in your JStore. You have added a following permissions to the strategy (i.e. 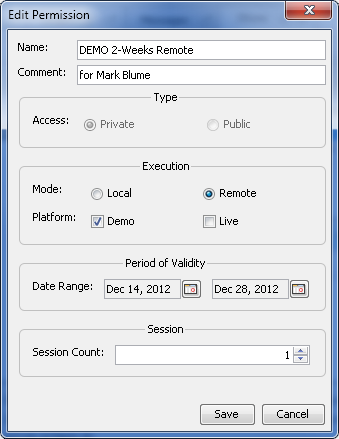 created an access key) - "the strategy can be run during two weeks in DEMO Dukascopy Remote Server only". Your strategy is protected against disassembling now due to no one has an physical access to the strategy. You have sent the key to a trader. Using the received key, the trader has attached the strategy reference to his/her JStore in a platform. Trader just sees the strategy name, but he does not have a physical access to the strategy. Therefore your code and intelligence work is protected. Trader can run the strategy in Dukascopy Remote Servers only and can see the strategy results. In case, you would decide to provide the trader with a full access to the strategy code, you can create a Full Access key for the trader. JCloud allows traders to save, open, and share strategies, indicators, workspaces, and templates in Dukascopy Online Protected Storage within a JForex platform or Dukascopy Community. You can save your JForex content (strategies, indicators, templates, workspaces) in your JStore. You can access your data from anywhere now. In JForex, open the JCloud tab from the Tools menu. To add a new custom folder to a parent folder, select a parent folder and press Add a folder button. 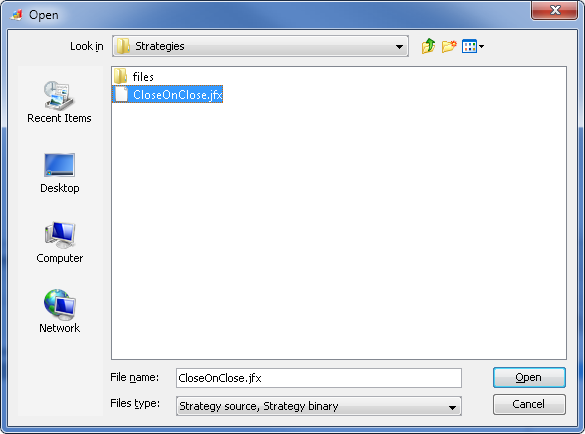 To add a new strategy to the custom folder, select the added folder and press Add a strategy button. To add a new access key for a strategy sharing or add a new version to your strategy, select a check box Advanced for the interface switching to the advanced mode. To add a new strategy version for the already added strategy, select the already added strategy and press the Add a version button. In the dialog window, navigate to a new version on your local drive and click on the Open button. Please notice a new version file name has to be equal to the already added strategy. 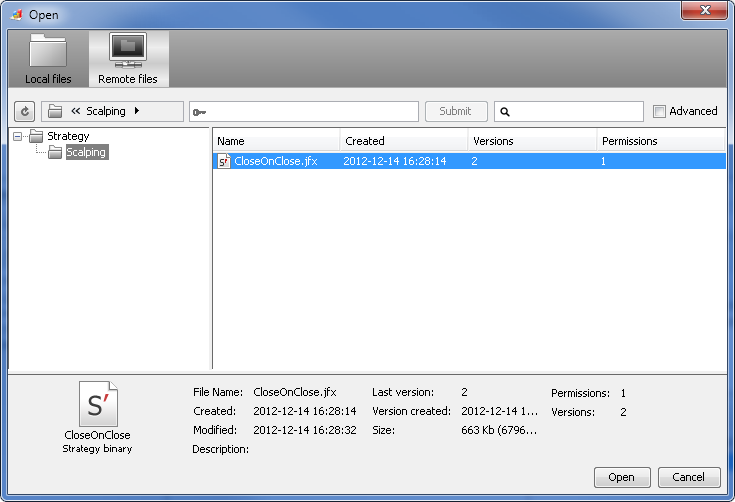 In the second dialog window, set a new version name and a new version description. To add a new access key for a strategy sharing, select the strategy and press Add a key. Please notice a new key will be added to all strategy versions. In the Edit Permission dialog window, define a new access key name, comment (optional), and set permissions. To provide a trader with the already added access key, select the key and press Show a key. In the Key dialog window, press Copy to clipboard and close the window. To send the key to a trader, select any communication programs - email, SMS, skype, etc. Paste the key in the selected program by pressing Paste command in the program menu or by pressing Ctrl+V keys combination. Open JCloud in the JForex platform. Paste the received key into a key field and press Attach button. 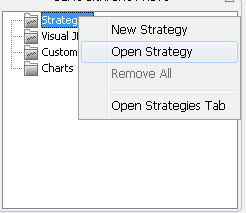 To run the attached strategy, press a right mouse button on a Strategies branch in a Workspace and select Open Strategy in the drop down menu. 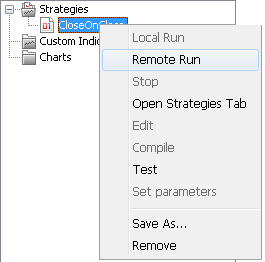 In Open dialog window, select JCloud button and select the attached strategy. Press the Open button. To run the strategy, press a right mouse button on the opened strategy in the Strategies branch in the Navigator and select Remote Run in the drop down menu.